Top Male Dog Names: Cute Puppy Names for Boy Cockers! Looking for top male dog names for new little boy? Our comprehensive database has just what you need; hundreds of cute puppy names for boys to help you choose something special for your new Cocker pup! As promised, you'll find a fantastic selection of puppy names for little boys below; some cool, some traditional, and many others unique...all waiting to tempt you! Choosing a name for your puppy is very subjective and is personal to you and your family. Some of the names I've listed may immediately grab your attention, others you may not like so much. Don't worry too much about that, (each to their own) simply select those that really grab you and add them to your short-list. To help you get the best out of our puppy names directory, there are a few points to think about before making your choice. You can read about them here. By the time you've finished drafting your short-list, you may have a dozen or so names (or more!) that you feel are really special and which seem an ideal fit for your new puppy. When you get to that stage, say each name out loud to see how it 'feels'. Does the name sound right? Does it 'roll off the tongue'? More importantly, do you think it suits your little boy's personality? The Best Puppy Names For Your Cocker Spaniel! 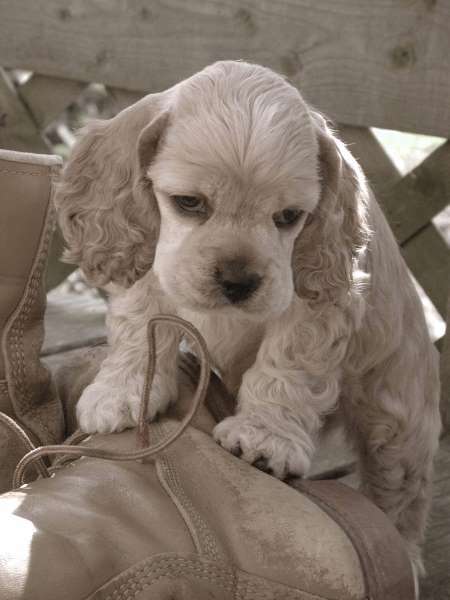 Hope I've helped and that you now have what you came here looking for; a fab selection of top male dog names that will suit your new Cocker Spaniel puppy perfectly! I'm sure you have, but just in case you need to see more, you'll find tons more puppy names for boys here.